The best EOD Medic Shears are unbelievably fast and sharp. 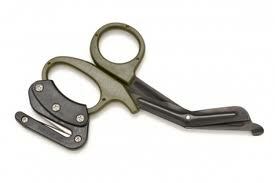 You never know when you're going to have a Cat A IED situation and have to cut through a uniform, flight suit, wet suit, boots, leather, harness or tubular nylon so you'll always need a great set of EOD Medic Shears on hand. Just Snip & Rip! Made by Rip Shears right here in the USA so you know you're getting the best quality. Trauma Shear, Safety Knife and Diagnostic Tool! Use them as standard shears when you have the time but when tactical efficiency is advisable, flip these over and rip through just about anything and everything with a quickness. Use the rounded edge as a Reflex Hammer to check DTR's, US Navy Dive Manual 5-A-3.6, for Neurological Deficiencies or to Purcuss a chest or abdominal cavity when inserting a chest tube in a combat environment. US Navy Dive Manual, 5-A-3.5.3 - Sensory Function - "An ideal instrument for testing changes in sensation is a sharp object." Sharp objects in a little black rubber boat doesn't seem like a great idea. The nose of the shear blade is curved preventing puncture of boat or patient at sea. Because the available facilities may differ on board ship, at land-based diving installations, and at diver training or experimental units, the responsible Diving Medical Officer or Diving Medical Technician are authorized to augment the emergency kits to suit the local needs. You no longer have to switch tools or hands when performing criticlal procedures and the shears can be Autoclaved to 270 degrees Fahrenheit! High quality, CE-Approved fully assembled surgical stainless steel shears with a Black Titanium Nitride TiN coating! Small enough to cut any angle! With Bulk Pricing available starting with 2 Rip Shears, you can easily get one for each bag you have. These shears are a perfect addition toy tool bag.